Laserdisc was one of the first home media formats to come about in the late ’70s. Followed a few years later by VHS and Betamax, Laserdisc was different for many reasons. Not only because of it being an optical disc format, but it was superior in terms of picture and sound quality. Due to costs of the format, it was eventually overtaken by the cheaper tape-based formats. “Is the decline into invisibility irreversible and irresistible?” (Gunning, 44). Laserdisc proves that a decline into obscurity can be reversed. Since the format became obsolete, there are many people who have begun to collect laserdiscs. While players and discs have become scarce for a decent price, consumers still exist for the format. Many friends and family members of these collectors aren’t familiar with what laserdiscs are, even when the term “Record-sized DVD” is used. Not everyone is oblivious to its existence, however. Various popular shows, such as Regular Show, have spoofed the format and brought the concept to a younger generation. Gunning mentions that his essay, “Re-Newing Old Technologies”, “is perhaps more intimately involved with novelty than with technology” (Gunning, 39). This notion is also evocative of the novelty of the Laserdisc format. By the standards of 2014, Laserdisc is very out of date. The format cannot compete with the advances presented by Blu-ray or high definition streaming. Laserdisc is more novelty and nostalgia than actual technological worth. The four stages of amazement, as noted by Onians, are; 1. a striking experience, usually visual, but sometimes aural. 2. a consequent physical paralysis. 3 a mental reaction which results in something being learned why may be followed. 4. a new action. Onians stated that “the sixteenth and seventeenth century as the last great period of wonder” (Gunning, 42). 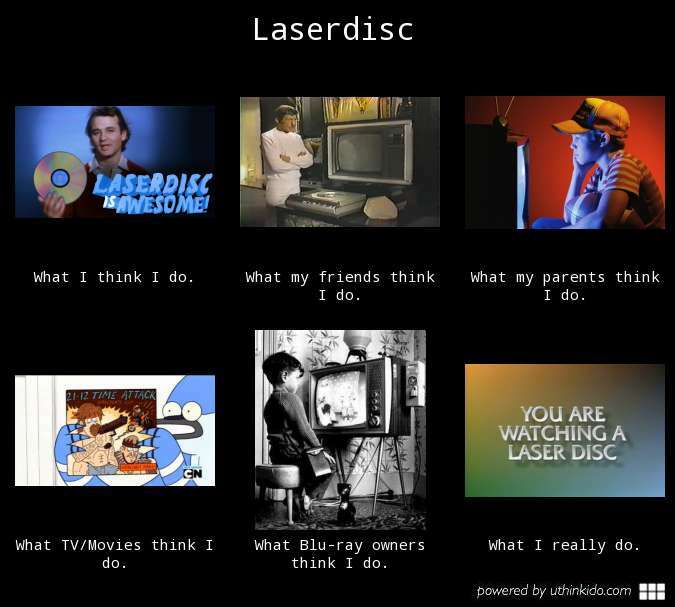 However, Laserdisc does relate to each of these four stages and came at a much later time. Laserdisc offered a “striking visual experience, as well as an aural one”. Laserdisc had excellent picture quality and made use of digital audio instead of analog. The “consequent physical paralysis” can either relate to the viewer becoming inundated with numerous video options or the freeze on significant advances in the home media format. The “mental reaction” was the idea that people wanted to view older media at home. This lead to the “new action” of various new formats, such as VHS and Betamax, being created. “The recording of sound and the recording of images share a similar ambivalence in the face of death.” (Gunning, 49) is the quote from “Re-Newing Old Technologies” that best sums up the existence of old media. While they might fade into a obscurity, they will never become completely obsolete. Thanks to sites like eBay, people can continue to collect Super 8 films, Betamax tapes, VCDs and laserdiscs. There is no true “death” for these formats. There is only new life that can be renewed again and again. Gunning, Tom. “Re-Newing Old Technologies.” (n.d.): n. pag. Web. 21 Jan. 2014. “LaserDisc FAQ.” LaserDisc FAQ. N.p., n.d. Web. 27 Jan. 2014. “Total Rewind.” Total Rewind. N.p., n.d. Web. 02 Feb. 2014.